Two gites, full of original features and character, each Gite has its own entrance and are newly refurbished to a high standard. There is a large garden with BBQ and garden furniture. For the children there is a play area, trampoline and swings. 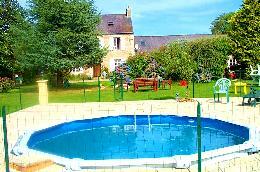 There is also a swimming pool with terrace and sun lounges.